There are five different categories of food: Fruit, Vegetable, Grain, Protein, and Dairy. When spawning, The Player starts with each category of nutritional value completely full. 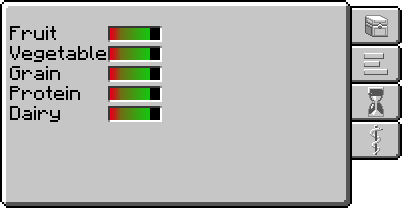 Each of these categories' levels are represented with a visual bar on the health tab of the player's inventory. As the player's hunger depletes, their nutrition bars will slowly deplete as well. In order to replenish the bar, the player must eat some food in that category. When the player is satisfied, they will gain residual nutrition based upon the player's current nutritional levels with more nutrition gained when the player is malnourished than if they aren't. The first four categories account for 25% of the player's max health, with the dairy bar giving an additional boost of up to 25% the possible max health. For example, a starting player with no levels has a possible max health of 800HP with all four of the first categories filled. If one of these categories are empty while the other three are full, the player will have a max health of 600HP. If the player has a full dairy bar in addition to all four of the main categories being full, they will have a max health of 1,000HP. As the player's max health changes, the numbers overlayed on the health bar will update to match. Every piece of food will have a weight value on its tooltip. This value is also represented with a white bar overlayed on the item, filling from left to right as the weight increases. The maximum amount that a single slot can hold is 160 ounces(oz). Food sources that provide more than 160 oz of food (such as animals) will drop as many max-weight pieces as possible before dropping a single, non-max weight item. 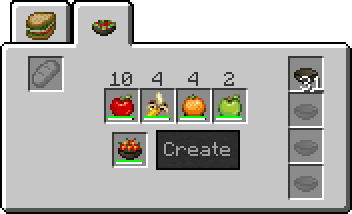 Hovering over a single food item in the player's crafting inventory and pressing S will combine all of that specific food item into larger stacks. Multiple key presses may be required for larger quantities of individual stacks. Alternatively, multiple pieces of food that are underneath the maximum weight can be crafted together to create a single piece of food of the combined weight. Up to 9 pieces of food can be crafted together at once, and the output slot will produce single max weight pieces, consuming individual pieces in the grid until all that is left is a single non-max weight piece in the grid, or all the remaining pieces can combine into one of less than or equal to max weight (e.g. combining four 100 oz pieces will result in two 160 oz pieces and a single 80 oz piece left in the grid). If a piece of food that has no decay is crafted with a knife, it will be cut in half. This is useful for sharing food with multiple players, splitting food to store in vessels, and splitting food for use in barrel processing. When eating any food other than a sandwich, the player can consume a maximum of 5 oz at a time. When eating a sandwich, the player will attempt to consume the entire weight. The player's stomach can hold a maximum of 24 oz of food, and if their stomach level is above 19 oz, they will only consume enough to fill their stomach. This means that it is impossible to over-eat, and saturation is therefore only acquired through eating tasty food. Every piece of food consists of five separate taste categories: Sweet, Sour, Salty, Bitter, and Savory. These taste values are affected by changes to the food such as cooking, salting, pickling, etc. For crops, the taste of the harvested product is dependent on the pH and drainage levels of the area. For animal drops, the modified taste values are completely random. Combining two pieces of a single food with different taste values will result in an item with the default taste values for that specific food. Note: The text displayed in the tooltip is entirely relative to the player's taste profile. A food that says "Not Sweet" means that the sweet value is less than the player's desired sweet value, it does not mean that the food has no sweetness to it. Each player has their own individual taste profile, which changes depending on the username and world seed. This profile is a number for each of the categories that the player finds perfect. Depending on the player's cooking skill, the advanced tooltip (Default: L-Ctrl) on a piece of food will be more or less descriptive of how close the taste of that food is to the desired taste profile. 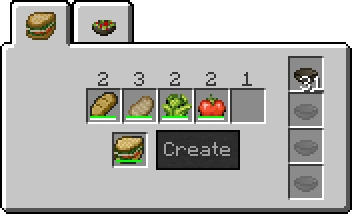 For prepared food such as sandwiches and salads, the tooltip is dependent on the skill level of the player that created the meal. This means that a player with a low skill level will be able to see the highly descriptive tooltips of a meal that was created by a player with an expert skill level. Sandwiches and salads are a way for players to mix and match foods to create a dish which is tastier, and therefore gives the player saturation. The tastier the food, the more saturation it will give. When making a sandwich or salad, all of the tastes of the individual ingredients are added together to determine the taste of the final result. In order to create a food prep surface, the player must Right Click with a knife on the top of a solid wood, stone, or metal material. Note: Sandwiches and salads do not behave like other foods in that they cannot be crafted with a knife to remove decay, combined into larger stacks, or split into smaller pieces. This is the trade-off for being a multi-nutritional food that can give saturation boosts. Sandwiches also have the benefit of being able to be consumed entirely at once. Selector Tabs - Toggle between sandwich and salad creation. Bread Slot - Input slot for the bread required to make sandwiches. Ingredient Slots - Input slots for additional sandwich ingredients. Weight Indicators - Displays how many ounces of food will be consumed in each slot when a sandwich is created. Output Slot - Output slot for created sandwiches. Create Button - Creates a sandwich. If an invalid combination of food has been placed in the interface, or there is an item in the output slot, this button will be greyed out so the player cannot press it. Storage Slots - Unused additional slots for miscellaneous storage. Sandwiches have a minimum required weight of 7 oz. The type of bread used in the bread slot determines the icon of the finished sandwich. The remaining four ingredients can be any combination of food that means the minimum weight requirement that does not repeat a specific base ingredient. For example: Carrot, Carrot, Tomato, Potato is not a valid combination because Carrot is repeated twice. Smoked Beef, Salted Beef, Pickled Beef, Brined Beef is not a valid combination because Beef is repeated four times. Bread Slot - Unused storage slot for the bread required to make sandwiches. Ingredient Slots - Input slots for salad ingredients. Weight Indicators - Displays how many ounces of food will be consumed in each slot when a salad is created. Output Slot - Output slot for created salads. Create Button - Creates a salad. 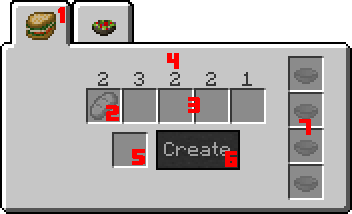 If an invalid combination of food has been placed in the interface, there are no bowls in the storage slots, or there is an item in the output slot, this button will be greyed out so the player cannot press it. Storage Slots - Input slots for bowls required to make salads. Salads have a minimum required weight of 14 oz, and there must be at least one ceramic bowl in the storage slots. The ingredients can be any combination of food that means the minimum weight requirement that does not repeat a specific base ingredient. For example: Red Apple, Green Apple, Banana, Banana is not a valid combination because Banana is repeated twice. A bacon salad consisting of Smoked Pork, Salted Pork, Cooked Pork, Brined Pork is sadly not a valid combination because Pork is repeated four times. For the majority of food, the decay level is represented via the durability bar on the item, as well as a numerical percentage on the tool-tip. The exception to this rule is milk, which has a tool-tip message of Fresh, Old, or Sour. The durability bar is green during the first 10% of decay, and then turns red. The rate at which a piece of food decays is dependent on the item, as well as the ambient temperature. Light levels affect temperature, so the best place to store food is in a cool, dark place. These general types of food decay for non-preserved items in order of fastest to slowest: Raw Meat & Cooked Eggs --> Fruit --> Whole Grains, Flour, Dough, Bread, Vegetables & Soybeans --> Cheese, Raw Eggs & Refined Grains. Regardless of the type of food, decay rates are compounding (i.e. An apple with 50% decay will decay faster than an apple with 5% decay). To circumvent this, the decay can be trimmed from all food in a player's crafting inventory by keeping a knife in the inventory or crafting grid, and pressing D while the crafting inventory is open. Alternatively, a piece of food that is decayed can be crafted with a knife to remove the decayed portion (e.g. crafting a 100 oz potato that is 25% decayed with a knife will result in a 75 oz potato with 0% decay). Milk cannot have its decay removed. The tracking of decay is based off of the calendar date and time, so skipping time forwards through the use of a bed or commands will result in the food decaying the same amount as if that time frame had passed normally. This also means that items in environments that do not tick properly (such as on the ground, or in other mod's containers) will instantly update and make up the lost decay as soon as it enters a player's inventory. For example: A player kills a pig, and then walks away so that the items are in unloaded chunks. The player returns a few weeks later to pick up the pork that did not despawn because the chunks were unloaded. As soon as the pork enters the player's inventory, it will rapidly make up for the lost time, quickly decaying until it disintegrates in the player's hands. There are many different ways to preserve food and change the rate at which it decays. Each method results in a decay modifier, meaning that if two methods stack together, the resulting effect on the decay is a multiplier equal to the two method modifiers multiplied together. When multiplying these two numbers together, it results in a smaller number, meaning that the food will decay slower. The majority of preservation methods can be used in combination to stack the modifiers. The combination of pickling and salting, and the combination of cooking and drying are the only two combinations of directly altering food that will not stack multipliers when used. Storage decay modifiers such as the ceramic vessel obviously cannot be used in combination with other storage decay modifiers such as storing in a barrel of vinegar. Ceramic vessels can store food up to 80 oz in weight. Food stored in a small ceramic vessel item has a decay modifier of 0.5. Note: Large ceramic vessels have no effect on decay rates. All foods can be cooked in either a firepit or on a grill. Food heated to temperatures over Very Hot result in burning and loss of the item. Cooked meat falls into one of five stages: Rare, Medium Rare, Medium, Medium Well, and Well Done. All other foods have cooked stages of: Very Light, Light, Medium, Dark, and Very Dark. The cooking stages of a piece of food simply affects the taste. The fuel used to cook the food also has an effect on its taste. All cooked foods have the same decay modifier, regardless of the stage it is cooked to. While cooked food has a decay modifier of 0.75, it affects the effectiveness of other preservation methods. For example, salted raw beef will simply have the salted 0.5 modifier, while salted cooked beef has a modifier of cooked 0.75 * salted 0.75 = 0.5625. Salt is used to extend the shelf life meat, and increase its saltiness. Salted raw meat has a salted decay modifier of 0.5, while salted cooked meat has a salted decay modifier of 0.75. All foods except those in the grain category can be pickled. Pickled raw food has a pickled decay modifier of 0.5, while pickled cooked food has a pickled decay modifier of 0.75. As long as pickled food is sealed within a barrel of vinegar, it has an additional decay modifier of 0.1. Cheese and brined meats can be hung on a smoke rack to smoke and/or dry the food. All smoked foods have a decay modifier of 0.75, while dried food has a decay modifier of 0.25. Note: Cooking dried food removes the dried decay modifier. For cereal crops, the harvest must first be refined by crafting it with a knife to get grains. These refined grains have a much slower decay rate than all other stages of cereal crops (Harvest, Flour, Dough, Bread). food decay Options which affect food decay. This is a global multiplier for food decay. Unlike FoodDecayRate which only modifies the base decay and not the environmental effect upon decay, this multiplier will multiply against the entire amount. Set to 0 to turn decay off. If a food item has not been ticked for greater than or equal to this number of days than when it is ticked for the first time, only a small amount of decay will occur. Set this to false if you want food to auto decay when a chunk is loaded instead of limiting decay when a chunk has been unloaded for a long period. When holding a Meal or Food in your hand, your hunger bar will now show a preview of how much of the hunger bar will be restored if you eat that item. Creating a meal prep area now requires a bowl in your inventory along with the knife. Added nutrition system and food decay. Overhauled meal creation mechanic & removed potion effects. Added 2 new meal types, Sandwiches and Salads. Removed the old generic Meal and redesigned the food prep interface. Sandwiches have a higher max food weight value than other meal types and the entire thing is eaten in one use instead of increments. Additionally sandwiches give a 25% boost to filling over other food types. Salads on the other hand are your basic meal and are incredibly easy to create. All foods have tastes associated with them. Each player also has a specific preferred taste profile that is determined by the players name and the world seed. All foods have a base taste profile which is then modified by various factors. When making a meal, all of the tastes are added together to determine the taste of the meal. Added Smoke racks for smoking and drying foods. The food must first be brined. After a food has been brined it can be stored in a container full of vinegar to pickle the food and drastically increase its shelf life. Added wrought iron grill for cooking up to 6 food items at once. Food has two different indicator bars. The top bar indicates the amount of decay on the food (Green for the first 10% of decay. Red for the other 90%). The bottom white bar indicates the weight of the food out of 160 oz. Added Hotkeys for quick food management. Press S in the inventory while hovering over a piece of food to combine all like food pieces. Press D in the inventory while it contains a knife to trim all decay. The Size/Weight of food stacks changed so that full food stacks weigh less in the inventory. As a result, they fit in more slots without needing to be split. Taste no longer directly affects the nutrition gained from eating a meal. Instead, it affects only the satisfaction gained, with more satisfaction being added the closer that the meal's taste is to the players preferences. When the player is satisfied, they will gain residual nutrition based upon the player's current nutritional levels with more nutrition gained when the player is malnourished than if he isn't. Less than 1/4 full hunger results in weakness and mining fatigue. Tweaked food prep UI layout. Added visual heat bar to food icons. Slowed decay for Wheat, Barley, Oat, Rye & Rice Grain (item, not category) to decay at the same base rate as eggs and cheese. Cheese can be smoked. It does not need to be brined first. The combining of food through the crafting table is meant to represent creating a bundle of multiple pieces, and not mashing the items together to create a single super food that weighs more than the average newborn child. Raw fish is the only food that is inedible on its own, but can be used as an ingredient in sandwiches and salads. While brining is required in order to use other preservation methods, it has no decay modifier of its own. A successful BLT - Bacon (Pork), Lettuce (Cabbage), Tomato - sandwich on oat bread. A successful fruit salad combination. The "Create" button is grayed out due to pork being used in multiple ingredient slots. This page was last modified on 15 April 2015, at 18:06.